"A Campaign Fraught with Consequences"
Because of its extraordinary consequences and because of Abraham Lincoln’s place in the American pantheon, the presidential election of 1860 is probably the most studied in our history. But perhaps for the same reasons, historians have focused on the contest of Lincoln versus Stephen Douglas in the northern free states and John Bell versus John C. Breckinridge in the slaveholding South. 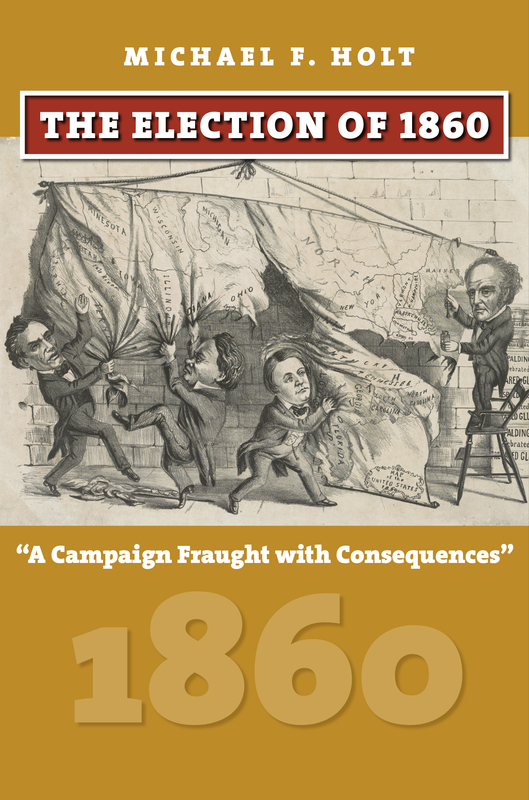 In The Election of 1860 a preeminent scholar of American history disrupts this familiar narrative with a clearer and more comprehensive account of how the election unfolded and what it was actually about. Most critically, the book counters the common interpretation of the election as a referendum on slavery and the Republican Party’s purported threat to it. However significantly slavery figured in the election, The Election of 1860 reveals the key importance of widespread opposition to the Republican Party because of its overtly anti-southern rhetoric and seemingly unstoppable rise to power in the North after its emergence in 1854. Also of critical importance was the corruption of the incumbent administration of Democrat James Buchanan—and a nationwide revulsion against party. Grounding his history in a nuanced retelling of the pre-1860 story, Michael F. Holt explores the sectional politics that permeated the election and foreshadowed the coming Civil War. He brings to light how the campaigns of the Republican Party and the National (Northern) Democrats and the Constitutional (Southern) Democrats and the newly formed Constitutional Union Party were not exclusively regional. His attention to the little-studied role of the Buchanan Administration, and of perceived threats to the preservation of the Union, clarifies the true dynamic of the 1860 presidential election, particularly in its early stages. Michael F. Holt is Langbourne M. Williams Professor of American History Emeritus, University of Virginia. He is the author of many books, including The Rise and Fall of the American Whig Party, The Political Crisis of the 1850s, and By One Vote: The Disputed Presidential Election of 1876.